I’m very excited to introduce chonggak-kimchi to you today, a special kind of kimchi made with radishes called chonggakmu. Chonggak-kimchi is often translated as “ponytail kimchi.” I think it’s an awesome translation because the name not only sounds cute but the greens on the radish look like real ponytail. You’ll never forget the name once you hear it. The radish is firm and crispy and the greens are soft, so you can imagine the texture and taste of this kimchi: both crunchy and smooth. This kind of radish is not found in many countries outside for Korea, but I found a few companies that sell the seeds online, so you can grow your own. But you can easily get this radish at a Korean grocery store. Ask them, “I’m looking for chonggakmu!” “I want to make chonggak-kimchi!” Good quality chonggakmu have a radish that looks like a cute curvy bulb, and are not more than 4 inches long, with soft greens. After he got paid, he led us to his home on the farm, and made warm rice with a rice cooker. “I’m making rice for you now. When the rice is done, eat it with kimchi. That’s all I have for you.” He opened his refrigerator and took out a huge glass jar filled with ponytail kimchi! Rice and ponytail kimchi, that was our lunch! It was amazingly tasty and everybody made loud crunching sounds. “Ahh, delicious delicious!” I kept saying until I emptied 2 bowls of rice! Peel the radishes but keep the green stems attached. Cut off the tails and remove the dead leaves. Cut the radishes in half lengthwise. Grab the 2 halves with both hands, split the greens, and put them into a large basin or bowl. Repeat this until you’ve cleaned all the radishes. Add some cold water to the radishes in the basin, and then drain. Sprinkle the radishes with ½ cup of kosher salt and mix with your hands. Let it sit in the salt for 30 minutes. 30 minutes later, turn over the radishes so they salt evenly and let it sit for another 30 minutes. Total salting takes 1 hour. Wash the radishes thoroughly about 4-5 times to remove any dirt and excess salt, and drain in a colander. Mix ¼ cup flour and 2 cups of water in a pot and heat over medium heat. Keep stirring until it thickens. When you see some bubbles, add 2 tbs sugar and stir for 1 more minute before removing from the heat. Mince 12 cloves of garlic and half a medium sized onion (about ½ cup worth of onion). Chop 5 stalks of green onion. Set aside. Transfer the porridge to a large mixing bowl. Add the minced garlic and onion, 1 cup hot pepper flakes, ¼ cup fish sauce, and the chopped green onions. Mix well. Add the ponytail radishes and mix well with your hands. You can eat it right after making it, but this kimchi is more tasty when it ferments. Transfer the kimchi to a glass jar or a plastic container and keep it at room temperature for a couple of days. *tip: When it ferments, it will smell and taste sour, and the color of the greens will change to olive green. When the kimchi ferments, scoop some kimchi juice from the bottom of the container to the top so that the top layer of the kimchi won’t dry out and your kimchi will be juicy. Keep it in the refrigerator and enjoy! Posted on Wednesday, February 22nd, 2012 at 6:23 pm. Last updated on August 7, 2017. Posted December 12th, 2018 at 10:01 pm | Log in to reply. I have seen these radishes in my local Korean store and felt so curious about them! They are so cute, they look like cartoon vegetables. Now I have a recipe for them, and I can’t wait to get some! Posted December 14th, 2016 at 10:24 am | Log in to reply. Maangchi! I am making these today using my own homemade vegan fish sauce! Thank you for always being such an inspiration. I think our tastebuds must be very similar because your food always tastes EXACTLY the way I always loved it growing up. :) I was so nervous that when I went vegan, I wouldn’t be able to eat all my favorite foods from when I was little, but I have learned so much from your videos and blogs over the past year that I have been able to eat almost all my favorite foods. Can’t wait to add these to my recipe box! Posted November 7th, 2015 at 7:27 am | Log in to reply. 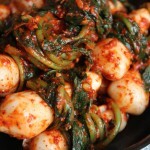 Is there any chance that I could use chonggak kimchi in place of baechu kimchi for kimchi jiggae if I’ve run out of the beach kimchi, or does that sound ridiculous? Thank you! Posted November 7th, 2015 at 8:45 am | Log in to reply. Just slice the radishes thinly and use them as you would baechu kimchi. Use the green part, too! I’ve made kimchi jiggae with kkakdugi quite often. No problem. Posted November 9th, 2015 at 5:46 am | Log in to reply. Posted November 7th, 2015 at 8:51 am | Log in to reply. Sorry, got a slight fever. Posted August 20th, 2015 at 7:49 pm | Log in to reply. Do you know when those radish are in season?? is it now?? because i think i remember seeing them in my grocery store (my non-korean one lol) but it was like in febuary or something and i don’t remember seeing those again this year so i was wondering if it’s in the winter of the summer? Posted July 25th, 2015 at 6:31 pm | Log in to reply. Do you know whether the fresh radish is supposed to be salty? I mixed it with the kimchi paste and this is before fermentation but it’s a little salty. Will it become better after it becomes fermented? Posted July 18th, 2015 at 2:39 pm | Log in to reply. I tried this recipe yesterday with bok choy that I salted for 1 hour. We had it tonight with pork and green bean dumplings and both me and my husband really loved it. Yesterday we tried Oi-muchim and loved that too. Next I’m gonna try this with red radishes, which are in season i Sweden now. I saw that you had one grocery store listed for Malmö, Sweden but I wanted to give you a tip about another one: Kina Center Livs on Möllevångstorget 7. I bought hot pepper flakes and hot pepper paste there but they have a lot of other korean ingredients and vegetables. It’s a really well stocked asian grocery store. Posted July 19th, 2015 at 10:32 am | Log in to reply. I’m glad to hear that you are doing some experiments with this recipe and they turn out successful! Red radish kimchi is great. I make it all the time. Posted December 20th, 2013 at 11:22 am | Log in to reply. Posted September 18th, 2013 at 8:19 am | Log in to reply. I know this has nothing to do with this recipe but can you please write my name in Korean? Posted September 18th, 2013 at 6:59 pm | Log in to reply. Posted August 17th, 2013 at 9:12 pm | Log in to reply. any kimchi that you can use them in? Posted August 18th, 2013 at 12:18 pm | Log in to reply. yes, red radishes will work well. I sometimes use them and always happy about the result. Posted April 21st, 2013 at 5:24 pm | Log in to reply. Hi i was wondering if this would work with japanese turnip? Posted August 18th, 2013 at 12:19 pm | Log in to reply. 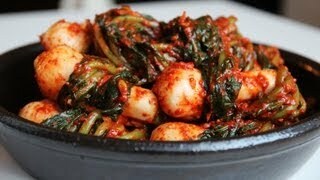 yes, Japanese turnip kimchi is very delicious! Posted January 14th, 2013 at 4:07 pm | Log in to reply. I made this for the first time this weekend. IT is so delicious! Thank you for the recipe, Maangchi. I shared it with co-workers, who don’t want to make it themselves: they just want me to make more! Posted January 15th, 2013 at 9:19 am | Log in to reply. Posted November 29th, 2012 at 6:00 am | Log in to reply. I am an admirer of Korean culture and have wanted to try the cuisine for a long time now. Fortunately when i was about to place an overseas order of kimchi, i stumbled upon this blog and am very glad to say that i just tried ponytail kimchi and it came out very well. Thank you for sharing the recipes. Posted November 29th, 2012 at 6:34 pm | Log in to reply. wow, I want to see your ponytail kimchi! : ) Delicious! Posted September 12th, 2012 at 12:05 am | Log in to reply. I just purchased ponytail radish from the korean market but the ponytail radish I purchased have green leaves that are rough and have spikes on the leaves, it is not smooth as you described… does that mean it is not edible? Posted November 29th, 2012 at 6:38 pm | Log in to reply. They are edible but the kimchi may turn out tough. To make good chonggak kimchi (ponytail kimchi), the most important thing is to find good quality ponytail radishes. The radishes should be firm, crispy, and juicy. The leaves are green and soft. If not, wait until you find better quality of ponytail radishes. Posted August 4th, 2012 at 5:50 pm | Log in to reply. Hello. Thank you for all your great recipes! I recently made the ponytail kimchi but mine came out salty. I washed the kimchi about 5 times & soaked in water but maybe not enough? I also doubled the recipe so maybe that ruined it? Any suggestions? Posted November 29th, 2012 at 6:39 pm | Log in to reply. Next time you make this kimchi again, use less salt and salt less time. Practice makes perfect! Happy cooking! This recipe was originally posted on February 22, 2012 at 6:23 pm by Maangchi. It was last updated on August 7, 2017. The video was watched 854,915 times on YouTube & has 7,789 likes!